in worthy vintages, Tablas Creek Vineyard produces small quantities of Panoplie: a Mourvèdre-based cuvée from meticulously selected grapes, made in the model of Château de Beaucastel’s Hommage á Jacques Perrin. In 2009, only 530 cases were produced. The 2009 Panoplie, rated 95 points by Tanzer’s International Wine Cellar and 94-96 points by the Rhone Report, was made available exclusively to Tablas Creek Vineyard’s VINsider club members. One bottle was included in the spring 2012 club shipment, with VINsiders offered the opportunity to order 2 additional bottles. In addition, VINsiders who reserved this wine as futures in December, 2010 received their wine in the fall of 2011. Ordering the Esprit de Beaucastel and Panoplie en primeur is available exclusively to VINsider wine club members. We have more information on the VINsider wine club, and more VINsider news. 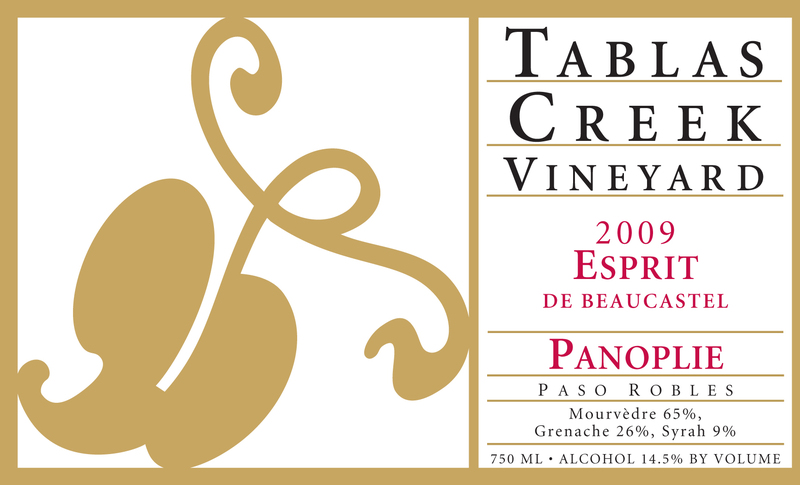 The Tablas Creek Vineyard Panoplie 2009 is a barrel-by-barrel selection of the most intense lots of Mourvèdre, Grenache, and Syrah in the cellar, structured for long aging. It has dark and savory aromas of black raspberry, eucalyptus, loam, and iron. The mouth is broad and rich but incredibly structured, with soy, garrigue and forest floor notes providing balance to the plum, currant and chocolate. The finish is long and complex, minty, brambly, and earthy all at once. We expect it to drink well for another year or so, then tighten up for a few years before reopening around 2017 and drinking well for two to three decades. Updated tasting notes from a December 2016 vertical tasting can be found on the Tablas Creek blog. The 2009 vintage was our third consecutive drought year, with yields further reduced by April frosts. Berries and clusters were small, with excellent concentration. Ripening over the summer was gradual and our harvest largely complete except for about half our Mourvedre at the time of a major rainstorm on October 13th. Fine weather in late October allowed us to complete the harvest successfully. Crop sizes were 15% smaller than 2008 and 30% lower than usual. The low yields and gradual ripening resulted in wines with an appealing lushness, rich texture and wonderful chalky tannins. Syrah began the harvest of our reds between September 17th and 24th, followed by Grenache between September 26th and October 3rd, and Mourvèdre between September 30th and November 3rd. The grapes for our Panoplie were grown on our 120-acre certified organic estate vineyard. Each lot was individually fermented using native yeasts in either upright oak casks or stainless steel fermenters. After pressing, the wines were moved into barrel, blended, and aged in one 1200-gallon French oak foudre before being bottled in July 2011.